I found the very first doll I bought for Barbie Who? today. Well, honestly, I hadn’t decided to make a blog at the time. I also planned on making her into a prop for family pictures. Wow, this is getting complicated, so let me explain. About six months ago, we planned on having a family portrait taken. We were going to get the normal, boring pictures as well as some pictures in fun outfits. For the fun outfits, we were doing a Doctor Who theme. I was going to be the TARDIS by wearing a blue dress and accessories. My husband was going to be the 4th doctor (sans curly hair). The baby was going to be a Dalek (courtesy of a popular dress pattern found on Revelry). I also wanted some fun props to really add life to the pictures. I crocheted several adipose plushies for the baby to interact with, I wrote words in Circular Gallifreyan on sticky notes, and I wanted to make a weeping angel. I found an amazing tutorial for a weeping angel on Pinterest and started keeping my eyes out for Barbie dolls at thrift stores. It took about a week, but I found her at a Salvation Army store at the bottom of a random toy bin. There was another doll, too, that was wearing a cool dress. Because I thought the dress would work well for the Weeping Angel look, I bought this doll and the dress for about a dollar. I liked this doll more than the other doll because she had articulated arms. This would make it easier to properly position the arms and hands to cover the eyes (it would be easier to cut and have fewer sharp edges by my thought process). Once I found the doll, I started looking for the more mundane supplies (glue, primer, polymer clay, etc.). The problem came when I couldn’t find the textured spray paint needed to cover the doll. The texture is what sets it from a spray painted doll to a very convincing statue. Because of that, I never made the mini-angel and she managed to get lost in the clutter of daily living. Fast forward to today. I was rummaging through the garage when I found her. She is still wearing the dress, too. I’m happy that I was able to find her; she is a gorgeous doll. Upon further inspection, she isn’t a Barbie doll at all. 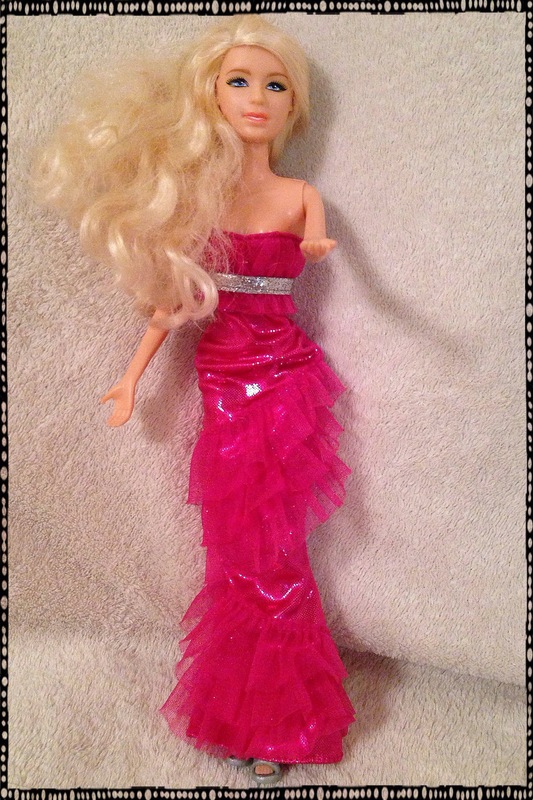 I thought she was a Barbie when I bought her, but now I believe she is a Taylor Swift doll. The markings on her back and neck are by the Jakks company and she looks like the dolls they sell on Amazon. I’m rather happy that I didn’t spray paint her. She has a unique look compared to the other dolls, and I would hate to hide it by making her a weeping angel. Although I bought her before I conceptualizer and created this blog, I still consider her the first doll I bought for the blog. I don’t have any immediate plans for her, but in time I am sure that inspiration will strike. Until then, I will continue working on Cofelia for Barbie Who? I am on the right track with the jacket, but it is tedious work. Keep an eye out for updates; I will do my best to get it done in a timely manner.